You all know what I’m talking about. Running is a mixture of highs and lows. These highs can come in many forms. It may be that you smash a PB. Or it could be a great training session. Even just a sunny autumn jog along a secluded leafy trail. I run for these moments. The positivity that running brings my life cannot be transcribed by my limited vocabulary. I try to explain to people how great running makes me feel, but all I end up doing is mumbling a mixture of jumbled superlatives. The highs are fantastic. I have heard running described as a drug. It’s addictive. I crave the elation that running has brought me previously. I live for it. But the lows. Oh the lows. As with life, highs cannot be sustained and low points are always seemingly close by. Maybe your performance drops. You have an awful race. A training session overcomes you. I was faster than this, what has happened? You miss a few runs and the next one seems so much harder than it should. Or you get injured. Every runner’s nightmare. Track Tuesday. I was feeling good. My confidence was high. 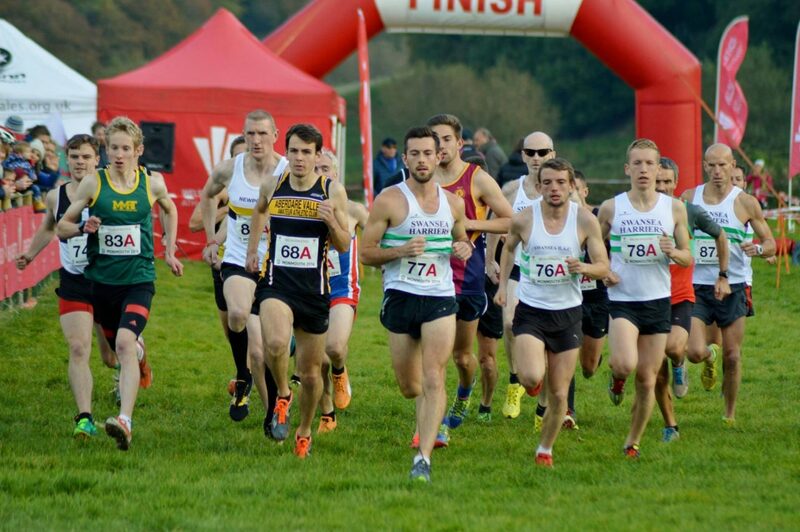 I had clocked the joint-6th fastest time in the Welsh Cross Country Relay Championships a few days earlier. I followed this with a lonely, yet invigorating 22 mile long run on the Monday. With 6 morning miles and a moderately difficult cycling test I should have been knackered by the time I got to the track, but I was psyched up for my first track session since early September. 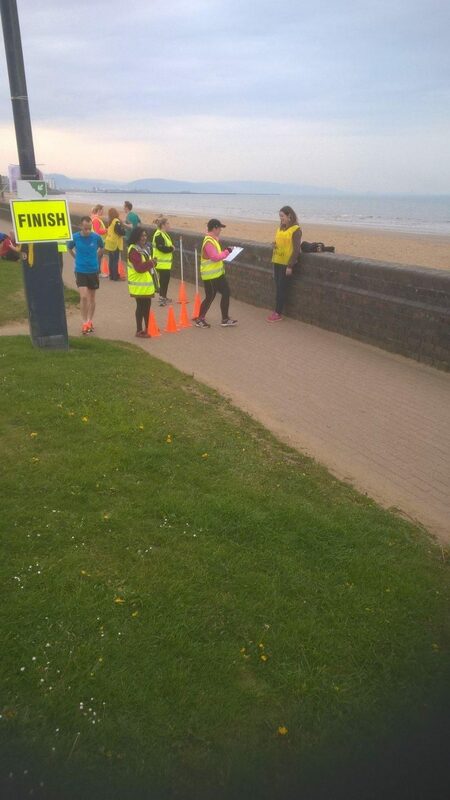 A decent turn out of Swansea Harriers started to arrive in dribs and drabs. As usual we chatted about football and running as we prepared for speed work. The demise of the Swans is a tough one to take, so conversation swiftly moved to the VO2 max scores that Ian and I had received that day. For those of you unaware, VO2 max is the maximum volume of oxygen that an athlete can use. It is often seen as one of the key physiological determinants of an athlete’s performance (see http://www.runningforfitness.org/faq/vo2-max). We were tested in a university laboratory the week previously. Unfortunately we had to be tested on a stationary bike rather than a treadmill, despite this form of exercise being fairly alien to us both. We had returned to the lab that Tuesday to collect our results and undergo an easier cycling test as the researchers monitored our blood vessels using ultrasound. So as we lapped the track we compared scores. I scored 71.3 ml/min/kg. Apparently this is slightly higher than Paula Radcliffe’s treadmill score the year she ran her World Record Marathon time of 2:15:25. However it is considerably lower than Seb Coe (77), Chris Froome (85), and fellow Harrier Dewi Griffiths (88). The session was reported to us. Eight repeats of 600m, with approximately 90 seconds recovery. Not a huge session but plenty to get stuck in to for my first one back I thought. A few drills and strides later and 8 of us were lined up for our first lap and a half. Dewi eased away from us in the first few hundred metres. I was next in line, with a pack of talented boys breathing down my neck just behind me. 1 minute 42 seconds for the first rep (4:28 min/mile pace). I wasn’t sure how fast I was meant to be going but if I could keep the pace near to this marker then it would be a good session. It’s lonely out front on your own, so Dewi wisely changed his tact for the remaining 7 repeats. He decided to give us all a head start of approximately 10 seconds each rep, and chase us down like rabbits. This left me leading the pack out. Unfamiliar territory, but I was happy to play a new game; stay at the front and don’t get caught by Dewi. The next twenty odd minutes were tough. The far side of the track was windy and I was not sheltered behind anyone the way I usually am. I kept my focus. Every repeat I could hear feet right behind me. ‘Don’t let them past Matt’ I repeated to myself. Seven down, and I was done. I had nothing left. ‘One more rep. Man up and do one more rep’. I set off knowing the end of the session was in sight. I was struggling. It was as if the pack behind me could sense my weakness. Through 400m and I was still at the front but I could feel my team mates start to make their move. This is called the burn up. When everyone decides to give everything because they know it is the final effort. On the bend I am losing it. Someone starts to pass me. Is it Dewi? Surely with such a deficit to make up, if he was going to pass me it would be on the final straight. Newcomer Logan comes wide and strides past me. He starts to move towards the inside lane as I struggle to keep pace. ‘You didn’t lead this whole session to be taken on the final 150 metres I screamed at myself internally’. I exploded in to a sprint and just squeezed past Logan on the inside. As soon as my legs and arms were pumping down the final 100m I knew no one was finishing my session on a negative note. 1 minute 41 seconds. My fastest 600m effort of the lot. I was flooded with confidence. Track sessions are not races against your team mates, but on this occasion it was what I needed to do to get the best out of myself on the night. All of the boys ran really well, and we were all experiencing one of those highs as we finished. As we gathered our stuff ready for a warm down, we noticed Dewi flying around the track again. He wasn’t finished. A few Km efforts and some 400’s on his own as we gazed on. I felt great about my own session, but a part of me wanted more. If it’s good enough for Dewi, then it’s good enough for us I thought. Next time. With my confidence sky high, I banked a 16 mile run on the Wednesday and a solid tempo session of 3 x 10 minutes on the Thursday. My attention turned to the weekend. 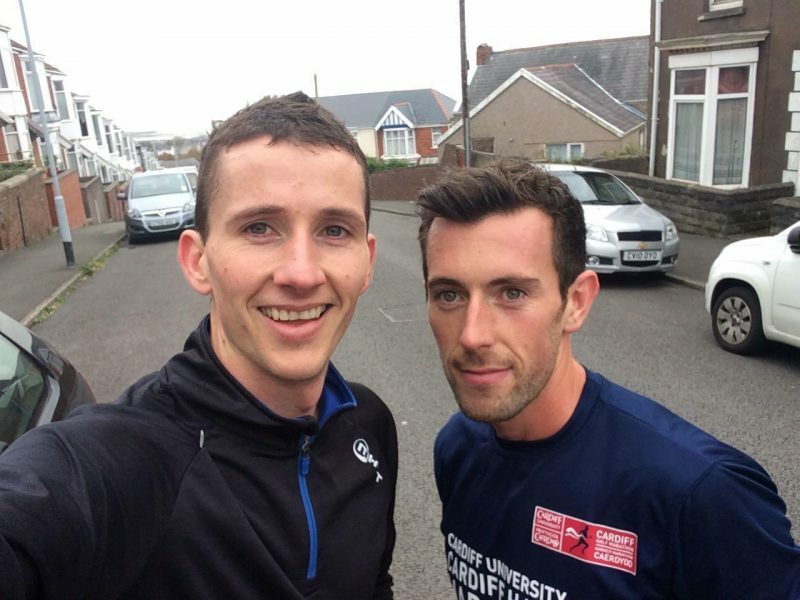 I had generously been entered in to the Snowdonia Marathon due to the fact my friend Adam Newton could no longer compete. Apparently, training in Santa Monica, California, trumps the wind, rain and pain of slogging out a Marathon despite the beautiful landscape of Snowdonia, Wales. I hadn’t prepared for a Marathon, but Snowdonia is one of my bucket-list races. I am desperate to go there and race. However a few reasons stopped me on this occasion. Firstly, I want to go there and race. I don’t want to turn up and just get round. I want to be with the leaders battling it out all the way to the final climb. With few long runs under my belt and no long tempo work; not to mention the lack of hill runs; I wasn’t in condition to go there and challenge the leaders. That would have frustrated me. I am not saying I will, or that I have the ability to, but when I rock up to the unofficial Welsh Marathon I want to believe that I can win. My second reason for not going to a race that I am desperate to run, is recovery. After London I didn’t start running well again for months afterwards. It put me back. I gave everything and tried to rush my recovery. A Marathon takes everything. I went in to London in absolute peak fitness and came out of it ruined. I couldn’t risk my Winter’s training being left out in the Welsh mountains. I have big plans and didn’t want to spend weeks or months trying to get back to where I was. My final reason was a personal one. Vicki couldn’t come to Snowdonia with me. I didn’t want to travel there and race alone. Vicki’s support gives me so much motivation and mental strength when I am hurting in a Marathon. Going to a big Marathon and racing alone just wouldn’t have felt right. I feel for her standing on the side-lines for hours as I run 26 odd miles, but in a Marathon knowing she is there makes a difference to me. I love and appreciate her support at shorter races, but it’s the Marathon where I really need her. I experience a different mental challenge during the Marathon, and knowing she is waiting at the end drives me on. With Snowdonia set aside for another year, I set my sights on my 5K PB. 16:00 is a frustrating PB. I have never run well over 5K. I have actually broken 16 minutes during the first half of Swansea 10K, but for some reason never converted this to an actual 5K race. My most recent assault on 16 minutes was a disaster as I imploded in the Welsh 5K Champs to a 16:37. Parkrun is like marmite. You either love it or hate it. Well I believe Parkrun is a great event. It offers runners of all abilities a weekly challenge and gets people out of bed and in to the fresh air. I know Parkrun isn’t renowned for being fast, and that you are much more likely to produce a PB in an actual race but I was feeling confident, and wanted to have a go nonetheless. Ian and I decided we would both head down and give it a go together. The target pace would be 5:04 min/mile, which would result in a 5K of 15:45. The plan was simple. Ian would lead out the first half mile at target pace. I would take over and we would alternate half miles until we reached 2 miles in 10:08 minutes. With just over a mile to go this would be our cue to race. Go as hard as we can and set the best times possible. We turned up at Swansea Bay Parkrun with very little time to warm up, but got a short jog and some strides done before it was time to go. Swansea Bay is always windy, but extraordinarily the weather seemed fairly calm. Strangely I was also feeling more nervous than expected for a parkrun. I don’t know if this was because I had built the run up as a PB attempt or because I was pacing with Ian, and didn’t want to let him down by running too slow or too fast in the half mile splits we were alternating. Three, two, one and we were off. Ian took the lead and I sat directly behind him as he tried to lock in on the target pace. It all felt very comfortable, but it should. One younger runner tried to stay with us but soon dropped off leaving the two of us heading towards our first half mile marker. 2:31. One second up on the target pace. I eased past Ian, as he took his turn to switch off and draft. I felt good and maintained the rhythm. Second half mile 2:31. A second too fast again, but comfortable. Ian repeats another 2:31. This is going amazingly, I thought. All I had to do now is my final half mile at target pace and then finish the job with the final mile all out. I started my final shift as pacemaker with a gradual, short incline. At the top of the short kick up I glanced at my watch. I’m way off pace. I needed to pick it up. I sped up as I tried to find those seconds I’d just lost. Ian started to drop off. “Come on Ian” I bellowed in his direction. He regained his focus and latched on to my heels again. I pushed on but my lap split was still too slow. I tried not to force it. 2:35. Three seconds slower than target pace. Damn it. But wait, that exactly totals the 10:08 target split for 2 miles. We were spot on. ‘Now let’s race! It’s time to break 16 minutes’ I decided. I kicked. Well it was supposed to be a kick but my legs weren’t going much faster than before. It was enough to form a gap from Ian. That wasn’t the aim though. The closer Ian could stay to me, the better we would both do. I was no longer going to look at the watch. There was nothing the watch could tell me that would make any difference at this point. Run as hard as you can and hold on. I reached the final 400 metres. I couldn’t hear Ian. I gritted my teeth and continued to push myself. I knew I should be sprinting by now but my legs just wouldn’t. This is where I really needed someone ahead to really spur me on. I knew I must be on for a PB. I crossed the line, with my thumb lurking over my watch ready to stop the clock. A familiar sight in thousands of official post-race photos these days. 15:38. Before I could even take it in, Ian came flying in. 15:42. We both smashed it. I was ecstatic. I had taken 59 seconds of my previous 5K attempt. 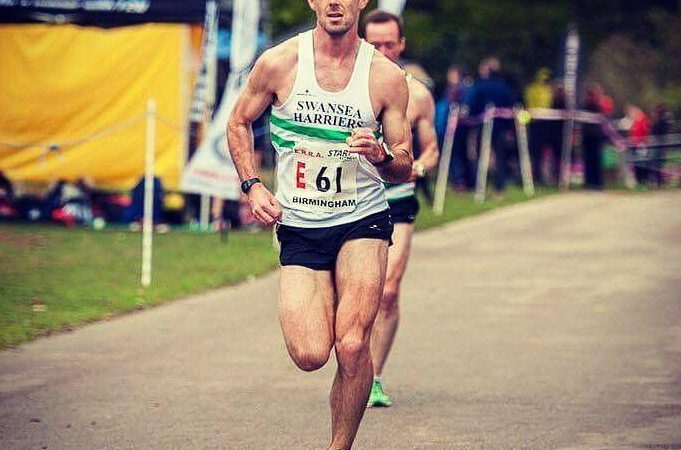 An attempt which was at a Welsh 5K Championships full of quality runners. I had finally broken 16 minutes. I had done all of this at a Parkrun. I had done this on untapered legs. Legs which had run 70 miles in the preceding 5 days. With no one to chase down, I had run my best 5K by a mile (not literally). Ian had also set a PB taking 8 seconds off his Armagh 5K time earlier in the year. Armagh is commonly known as one of the fastest road 5Ks around. An incredible field where Ian’s 15:50 was only enough to earn him 104th. Yet, he had smashed that time with only one other runner in his sights. We were both on a massive high. 5Ks hurt. They hurt in a different way to a Marathon. Your lungs burn. Your legs fill up with lactic acid. We didn’t care. It felt great to make a plan, and execute it so perfectly. We had both finished with our final two half mile splits being our fastest. We embraced the elation and continued running for some recovery miles. You couldn’t wipe the smile off my face. Hard work was paying off. It felt incredible. I was in the form of my life. I couldn’t wait to see what I could do in the fast Abbey Dash 10K in Leeds the next weekend. What I couldn’t see was the lows lurking just around the corner.